The Thyme Plant | Very Tasty, Super Healthy and Easy to Grow! and Healthy With Many Uses! 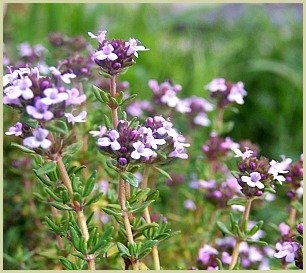 The thyme plant (thymus) has grown throughout the Mediterranean regions for centuries. A pleasing herb to look at with a wonderful flavour for use in the kitchen, and many healing properties for the body. A part of the mint family, there are more than 350 varieties of this plant, with common thyme being the one you'll most likely use in your cooking. Read more on the common variety. Other notable varieties you may come across include wild, German, Spanish and lemon. Nearly all of the 350 varieties are evergreen hardy perennials and nearly all blossom with small pink or mauve flowers, though some varieties do have purple or white flowers. This similarity between some varieties means that it can be tough to correctly identify them. The thyme plant will grow under most conditions. It loves full sun, and well-drained soil, but it will tolerate shade and can even grow in poor soil, with added fertilizer. It's also looks lovely in the garden, and as an evergreen it keeps its colour all year round, even after a cold winter. Thinking of Growing the Plant? Due to its decorative look, lots of people grow it just for its ornamental qualities and alluring fragrance. It makes a beautiful border around other plants and can be used as a ground cover or in rock gardens. The shrub will grow to a foot in size, or even a foot and a half, and will attract bees to your garden. So with so little effort required, and so many uses and benefits, why not consider planting some in your garden? All you need is a cutting or a few seeds, and some time this spring and you are on your way to enjoying all the benefits of thyme. See the growing thyme page for tips and advice on this. Because of its origins, it has always been a staple in the cuisines of countries all around the Mediterranean regions, from Portugal and Spain to North Africa and Iran. With its potent flavour, it's an ideal accompanient to stews, meats and root vegetables as well as lighter tomato and egg dishes. In France, common thyme is a key part of the bouquet garni, and in herbes de Provence. Unlike a lot of herbs, it doesn't lose its flavour even after drying and can be used equally well either fresh or dried. Even after freezing it easily retains its potency. Throughout the ages it has been used as a traditional medicine. And in the early 18th century German scientists found that this popular herb had strong disinfectant qualities. With its anti-bacterial, anti-fungal and antiseptic properties, extracted thyme essential oil has a whole host of uses for a range of ailments. And you'll often find it in toothpaste, mouthwash and alcohol free hand sanitizers. Click here to read much more on the many health benefits of thyme oil. ...a good way to appreciate the healing properties of this herb, even if you're not ill, is to make a drink with it. And I often enjoy a healthy cup of thyme tea. This tea also has antiseptic properties, and is particularly effective for sore gums and throats, and if you let it cool, it makes an excellent gargle and mouthwash. For a recipe to make your own, click here. Sage - Nearly a 1000 Varieties to Choose From!